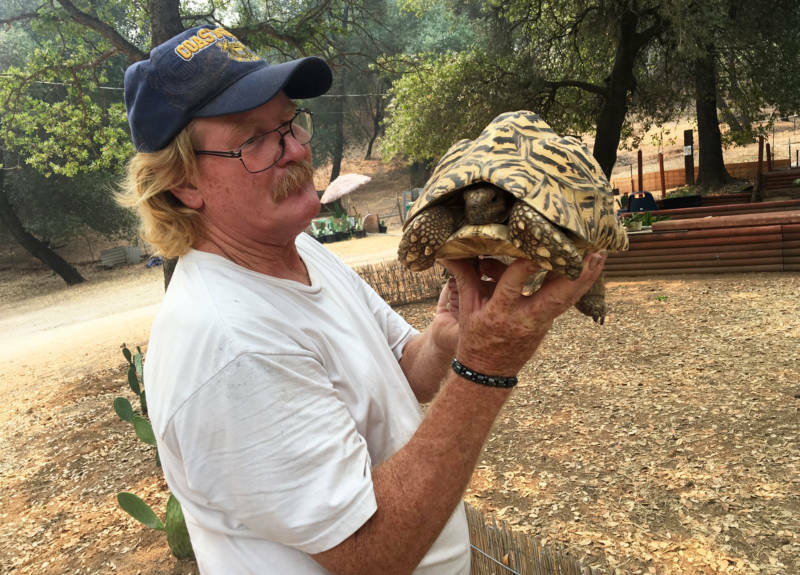 Ken Hoffman had been relatively calm during the first few days of the Carr Fire in Shasta County. The blaze seemed pretty far off to the west, burning in the wilderness around Whiskeytown Lake. The 10 acres of land Hoffman and his wife, Kate, own near Redding seemed safe. Then, on Saturday, he heard the casino a few miles away was getting ready to evacuate. Kate rushed home. She said the animal sanctuary down the road was packing up. Ken went outside. Embers were falling from the sky, landing in the dry grass. The air was thick with smoke and ash. He looked at Kate. They both knew it was time to go. Problem is, it wasn’t just them and all their stuff they had to get out. There were all the animals. Lots of animals. Dogs, birds, a llama, turtles, and of course their babies: the tortoises. All 80 of them. Moving them would be a monumental task even if everything went smoothly. But it didn't. In the midst of evacuation they were faced with a very big problem. Their pick up truck broke down. With the fires encroaching, they had no getaway vehicle. There are 17 wildfires burning up and down California right now. They’re being fueled by high temperatures, wind and years of drought. Collectively, they have destroyed more than 270,000 acres and about 1,000 homes. And it’s only the beginning of August. This has been one of the worst starts to a fire season in recent history. Tens of thousands of people are being displaced by these fires. The Carr Fire alone temporarily removed almost 40,000 people from their houses. Some have lost their homes for good. Many had to flee abruptly. All have been faced with the reality of losing everything and the decision of what to bring and what to leave behind. Redding, a city of almost 92,000 people three hours north of San Francisco, has been besieged by wildfires for over a week. Ken and Kate's home is just south of the city. 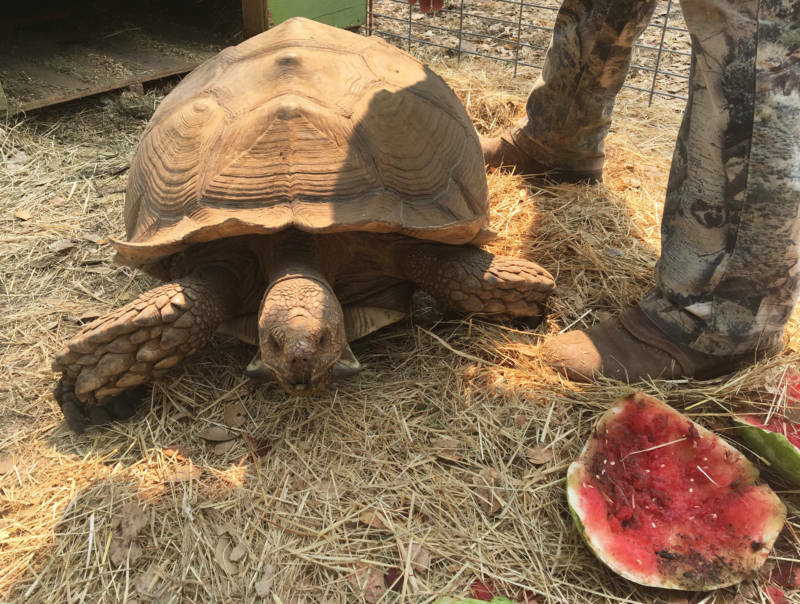 In the last two years, the pair has turned almost their entire property into a sanctuary for abandoned tortoises. Their project is called Tortoise Acres. A love of tortoises is new to both Ken and Kate. Ken is a fishing guide. Kate grooms dogs. But lots has changed in their lives recently. Ken had been married for almost four decades when his wife passed away a few years ago. He was depressed and thought about leaving the area. But then he started getting to know Kate. She grooms dogs and had been tending to his Pomeranian. 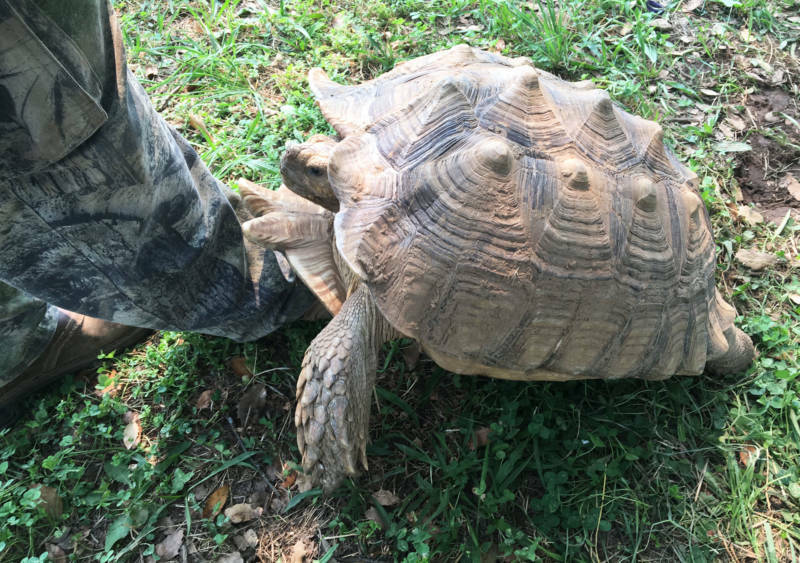 They ended up falling in love with each other -- and with tortoises. The pair are so committed to this reptile-rescuing life that they got matching tortoise tattoos. Hers is right below her collarbone. It’s simple. A small cartoonish outline of a tortoise with a little red heart inside it. Ken’s is on his forearm. It’s large and lifelike and peeling. That’s because it’s fresh. The pair just got the tattoos last week, right when the fires that would threaten their sanctuary first erupted. 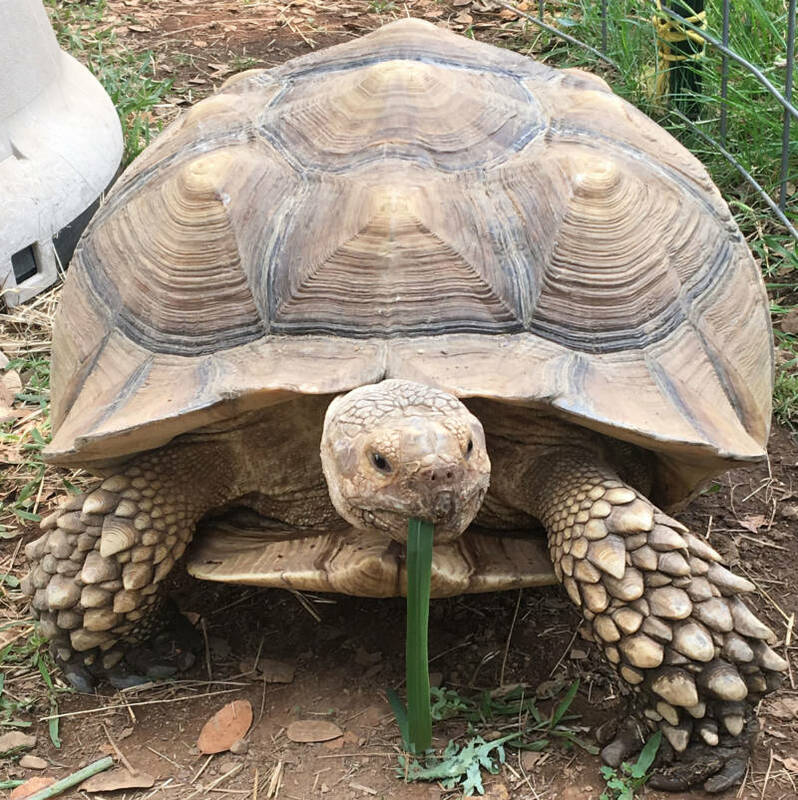 Ken and Kate have over 80 tortoises that they have rescued from across the country. Tortoise abandonment is fairly common. They live long and get big and many people who buy them eventually can’t or don’t want to care for the reptiles anymore. 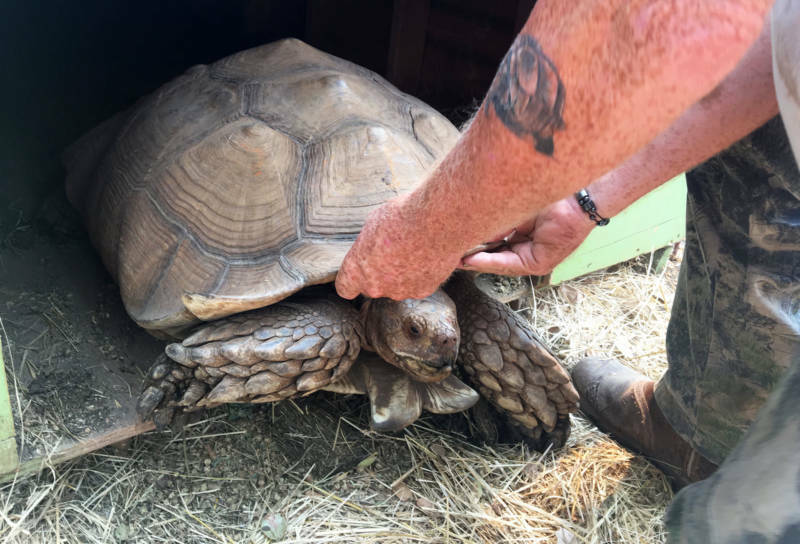 Ken and Kate have all sorts of species, from the common and easily bred sulcata tortoises to ones that are on the endangered species list like the Mojave and Sonoran desert tortoises. Their reptiles range from ones you can easily pick up to a pair of brothers -- Samson and Goliath -- that weigh over 200 pounds each. 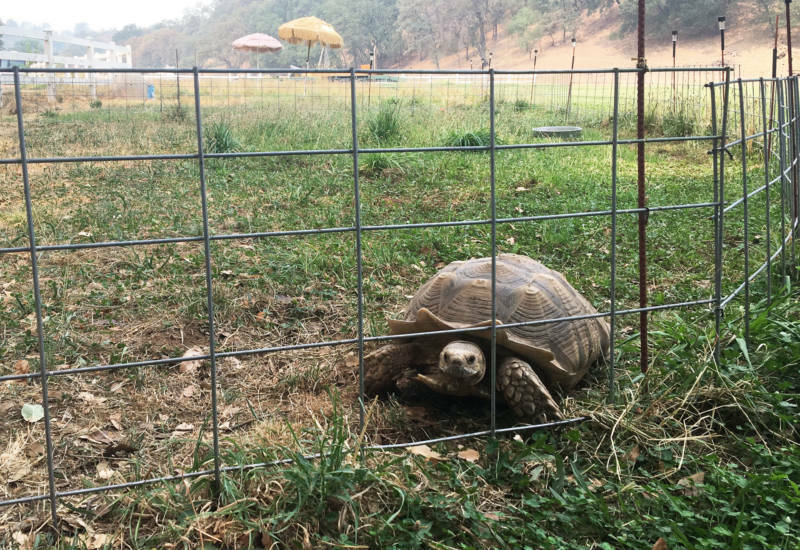 The tortoises live in little makeshift plywood huts and fenced enclosures built all around the property. They eat grass and vegetables. Sometimes, if they’re lucky, they get to chomp down on watermelon, which apparently they really enjoy. What these reptiles do not enjoy is forced, abrupt movement. Like, say, being roughly picked up. Or having to flee a fire. That was their fate last Saturday. As the embers were falling, Kate started packing belongings into a motorhome and securing all the other animals: a menagerie of birds and dogs. 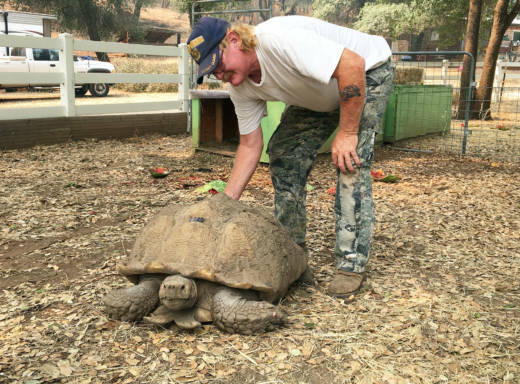 Ken got to work on the tortoises, wrangling them into a big horse trailer. It was no easy task, given the 200-pounders and the fact the males will fight each other. He had to build barricades in his horse trailer to separate them. It took Ken and Kate over seven hours to pack everything up. And then of course there was the truck saga. First they discovered their old truck had broken down. It had lost its high gears. Luckily, they were able to borrow a truck from a friend. Then, as they were driving, that truck broke down. Desperate, they posted on Facebook. In a few hours, a guy with a local fence company came through and lent them yet another truck. They finally had a viable getaway vehicle. After the exhausting pack, the couple headed away from the flames. It was night by the time they got out. The tortoises were stuffed into the trailer, bunked on top of each other, and getting very stressed. Pretty soon the suffering would turn into real medical issues for the cooped-up reptiles. Time was running out on their short-term solution of packing everyone into the horse trailer. And the couple had no long-term solution if they lost their property. But it didn't come to that. Weather and the work of local firefighters was on their side. As night crept on, the wind started dying down. They got good news that the fire near their homes was lessening. After a few hours, the pair decided it was safe enough to return home. They left all the tortoises in the trailer, so they were ready to go at a moment's notice. All that night they stayed up, anxiously tracking any progress of the fire. The conditions continued in their favor. Firefighters made progress containing the blaze around them and the nearby city of Redding. By the middle of the next morning, it seemed like the fire was contained enough that they wouldn’t have to make a speedy getaway. So, late Sunday, Ken and Kate finally let all the tortoises out to recuperate. The couple and their “babies” are safe for now. But they know they’re some of the lucky ones. The fires have taken people’s lives, pets and property all around the state. The Carr Fire alone has claimed the lives of six people and destroyed or damaged more than 1,000 homes. Ken recently bought Kate a button printer for her birthday. This week, as they decompress, she is working on buttons for all the firefighters, who are still battling the blaze. It’s a small token of appreciation, but she just felt like she had to do something to show her gratitude for those who protected both her human and her extended reptile family.